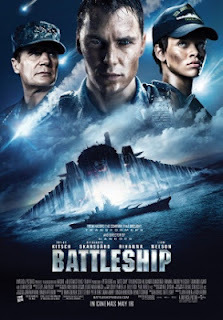 When I first read the news about the upcoming movie Battleship featuring Rihanna as part of the cast, I was skeptical & didn't feel like paying for a ticket to watch in the cinema. Since WL was eager to watch it, I decided to give it a try. Thank goodness it was a good decision made. I actually enjoyed the movie a lot for its entertainment value. The plot is straightforward - battling aliens & saving the world. Not new. Visual effects were impressive & it kinda bear resemblance to the Transformers franchise. Well, this movie was produced by Hasbro Studios so it's not surprising that the style is Michael Bay-ish. Not to forget the hottie, Taylor Kitsch. Just so hot with those pair of mysterious eyes. If you couldn't recall who he is, Kitsch last appeared in the self-titled film, John Carter & X-Men Origins: Wolverine taking the role of Gambit. I see that you remember him now, ah-ha. He usually has his long tresses whereas in Battleship, his hair is real short & still looked great on him. Seems like the hair trend among Hollywood hotties are medium, long wavy hair. Yum! As for Rihanna, I'd have to give credits for her acting skills. She's a decent actress - not that she acts poorly - she does her job well here but I wouldn't say it was great either. She can certainly improve but nevertheless, the experience will definitely help her in her future movie projects.